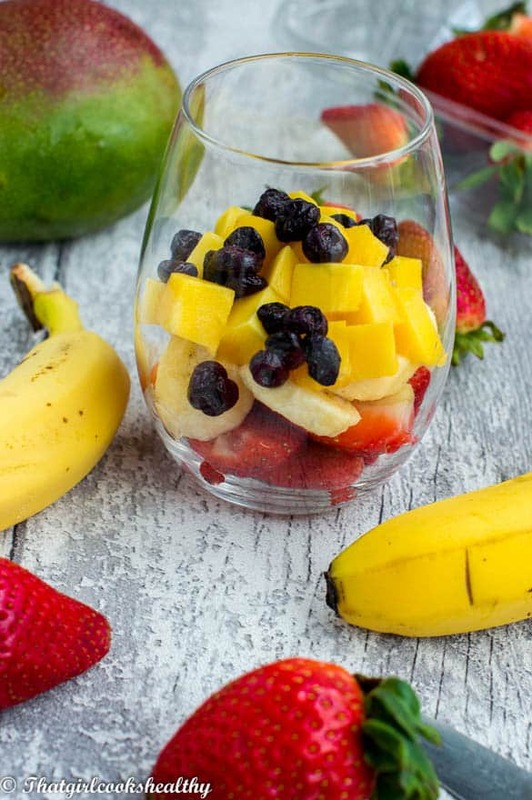 Fruit breakfast salad recipe – Start the day by cleansing your palate with an assortment of delicious mouthwatering banana, berries, mangoes and strawberries all in one serving. Smoothies are awesome and seem to be in vogue right now, especially in the summer months. It feels like the majority of breakfast recipes range from smoothies to granola or some type of superfood porridge. Ironically I am a fan of all three, so this isn’t a post berating either one of those. 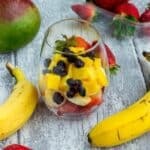 What inspired me to write this post and more importantly compose this healthy breakfast fruit salad recipe was to reach out to people who seldom eat or opt for a light breakfast. Not many people can tolerate a full on breakfast in the mornings, personally this isn’t a problem for me but I am surrounded by folks who exclude breakfast because they simply can’t face eating something “heavy”. As mentioned before, eating something in the morning is essential after fasting whilst sleeping. While smoothies are delicious, quick and convenient, our urinary system immediately discards what has not been used as waste, which encourages that sudden urge to visit the restroom. If smoothies, granola and porridge are off the agenda, what else can is there to eat for breakfast? 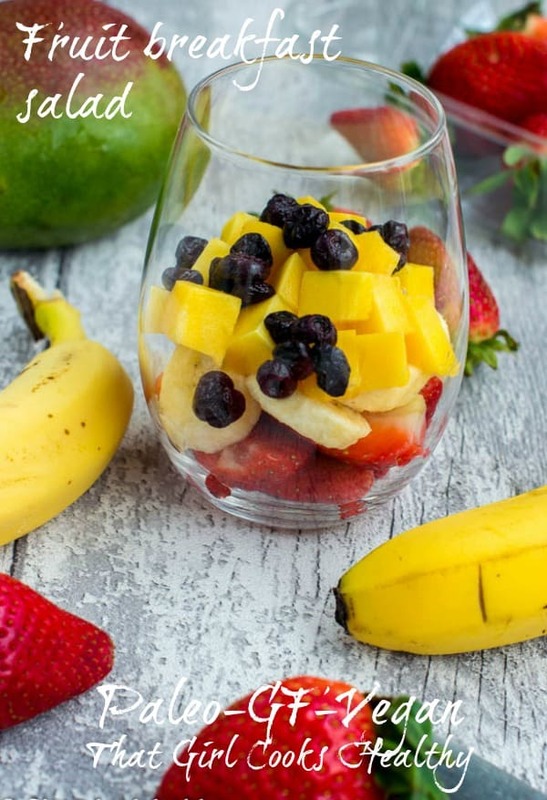 Why not try this wonderful healthy fruit breakfast salad. 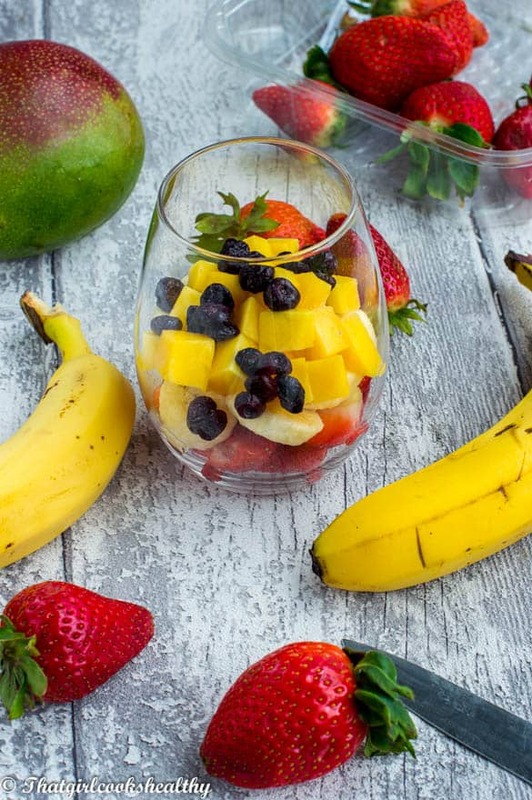 This breakfast is mouthwatering display of fruits; mango, blueberries, strawberries and banana for some iron enriched sweetness. This wonderful quad platter is the perfect solution for a light, healthy fruit breakfast. It’s definitely not too heavy on the tummy making it one of many breakfast ideas with fruit included. 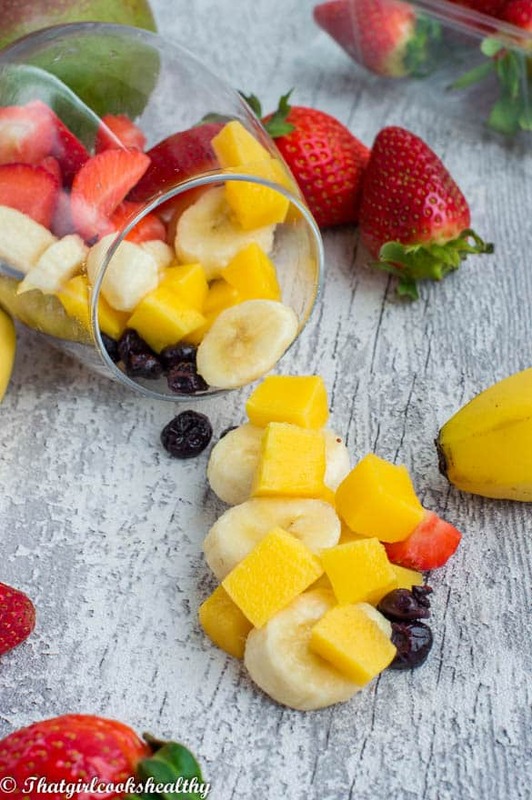 In fact eating a serving of fruit in the morning helps to ease digestion because fruit is broken down relatively quickly. The enzymes from the fruit can be used by the body to keep the gastrointestinal tract in working order. Mix a bowl of saline water (1 cup of water with 1tsp of himalayan pink salt) to omit the banana from darkening. 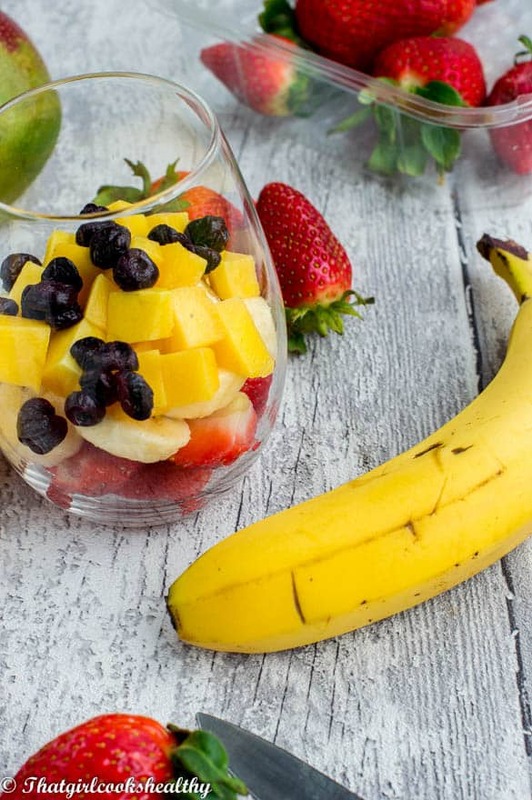 Arrange the fruit in a bowl/glass, serve accordingly. Submerge the sliced banana in saline water (water with 1tsp of himalayan pink salt) to avoid fruit from darkening. I am “lucky” that I can always eat a big breakfast in the morning. But that is probably because I workout in the morning, so I need that big breakfast. Thanks for your comment Dannii, that’s probably your body restoring what you’ve burnt off.